1. Why coding style conventions is important? Maintenance of software is very important. Exactly the maintenance brings much more profit than a one-time development. In my opinion a uniform code style is very important for teamwork, in the team all the code should look depersonalized, as if any member of the team could write it. Any team member can continue working on your code and he should not waste time adapting the code for the team’s style guide. Naming conventions make programs more understandable by making them easier to read. Package names are all lowercase, with consecutive words simply concatenated together (no underscores). For example, com.example.deepspace, not com.example.deepSpace or com.example.deep_space. Class names are written in UpperCamelCase. Class names are typically nouns or noun phrases. For example, Character or ImmutableList. Interface names may also be nouns or noun phrases (for example, List), but may sometimes be adjectives or adjective phrases instead (for example, Readable). There are no specific rules or even well-established conventions for naming annotation types. Test classes are named starting with the name of the class they are testing, and ending with Test or IT. For example, UserServiceTest or UserRepositoryIT. Abstract class with some basic functionality usually named as BaseSomething, for example: BaseEntity, or BaseArgument. There are no rules for naming interface implementations, if one interface have multiple implementation better to reflect main specific of implementation in the class name, for example: FtpFileScanner or SmbFileScanner. But if you have a single implementation of interface you can use names like SomethingImpl, for example UserServiceImpl or EntityMapperImpl. Method names are written in lowerCamelCase. Method names are typically verbs or verb phrases. For example, sendMessage or stop. Variable names are written in lowerCamelCase. Variable names should be short yet meaningful. One-character variable names should be avoided except for temporary “throwaway” variables. Common names for temporary variables are i, j, k, m, and n for integers. Do not use such variable names as l or o, because they can be confused with one or zero. The names of variables declared as constants should be all uppercase with words separated by underscores (_). Constants are static final fields whose contents are deeply immutable and whose methods have no detectable side effects. This includes primitives, Strings, immutable types, and immutable collections of immutable types. A name in the form used for classes followed by the capital letter T, examples: RequestT, FooBarT. At the minimum, Javadoc is present for every public class, and every public or protected member of such a class, with a few exceptions noted below. When you have nothing useful to say, say nothing! Javadoc is optional for simple method names like getTime, in cases where there really and truly is nothing else worthwhile to say but "Returns the time". it is not appropriate to cite this exception to justify omitting relevant information that a typical reader might need to know. For example, for a method named getCanonicalName, don’t omit its documentation (with the rationale that it would say only /** Returns the canonical name. */) if a typical reader may have no idea what the term "canonical name" means! Documentation is not always present on a method that overrides a supertype method, make your documentation on the super class. * Created by Korovin A. on 06.02.2018. * Helper for transformation data from Object to target class instance. * from fields described in arrays of Objects(sourceObjects). 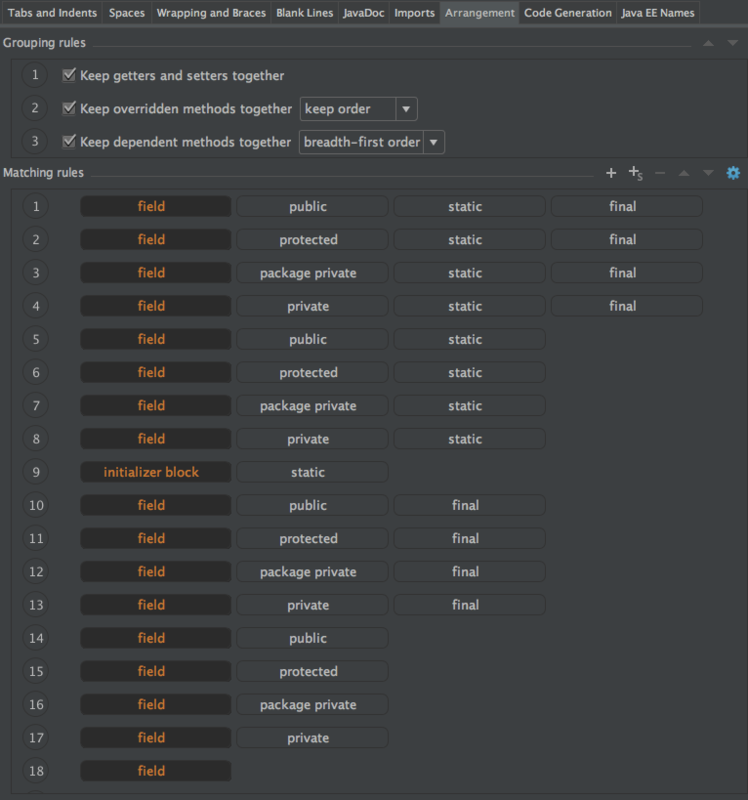 IntellijIDEA supports automation tool for arranging code sequence, based on the type of content. in my case, you can run the reordering of the code by pressing the Ctrl+Alt+L hotkey. My preferable settings shown on the picture below. * Created by Korovin Anatolii on 25.02.18.